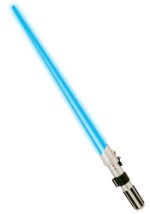 Bring down the Emperor and the Dark Side in this men's Luke Skywalker costume! This licensed costume includes a cream tunic and matching pants with attached boot tops. The shirt has long sleeves and the pants are secured in place with an elastic waistband. A brown, foam belt wraps around the waist and accents the costume. Team up with our Han Solo, Princess Leia, C-3PO, R2D2 and Chewbacca costumes for a heroic group!